McAfee is one of the most popular computer security software company’s in the world. 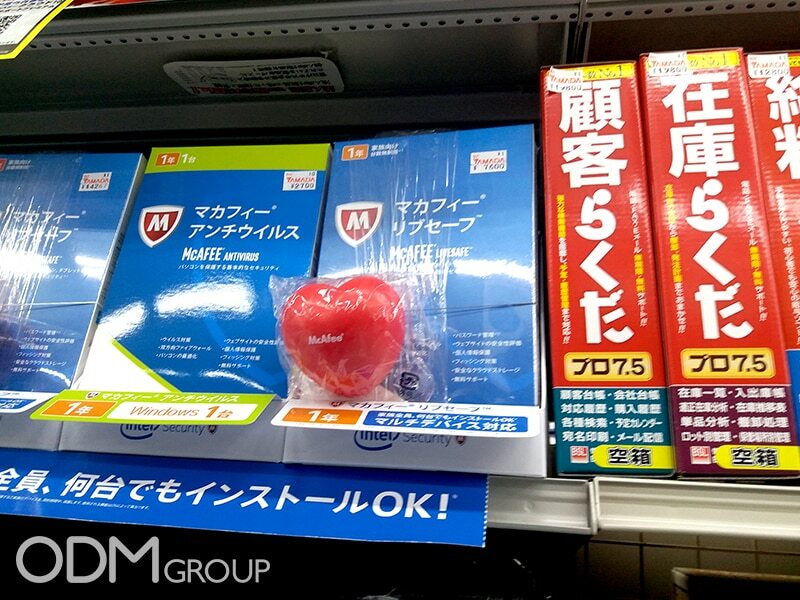 McAfree provides CD installation discs for their trusted security programs and they recently released a special heart-shaped edition. This branded stress ball is a gift with purchase promotion available in Tokyo. Consumers can get it in every purchase of McAfee ‘LiveSafe’ – the ultimate antivirus protection for personal computers, smartphones, and tablets. A branded stress ball is what its name implies, a malleable toy that you squeeze when you’re stressed that displays your brand name. Squeezing the stress ball helps you release any tension caused. It also helps you to pump your blood until it reaches the normal rate again. Using a stress ball is considered as the simplest, most effective method to release stress. Why you should offer a branded stress ball as a gift with purchase idea? Customers Loyalty: Stress is part of everyone’s life. However, feeling stressed all the time is unpleasant. In fact, stress can have a huge impact on how we can manage and minimize the side effects of stress. Moreover, customers will enjoy getting the stress ball to thank them for their loyalty. Brand visibility: As customers are generally stressed at their work place, they will play with the branded stress ball. Colleagues will see it and remember your brand’s name. It is a good way of advertising because everyone needs a security software, so they will be encouraged to buy the ball also. Customisable: As well as being able to print your brand name onto the stress ball ODM also have access to other exciting stress ball features to make your branded stress ball memorable. Your company can choose from products such as scented stress balls and colour changing stress balls. Are you still looking for an effective gift with purchase idea? Don’t stress yourself out. Contact ODM Group now! The ODM Group has years of experience in manufacturing high-quality gift with purchase items that your target customers will surely love. Don’t forget to check out our other gift with purchase case studies on the blog.